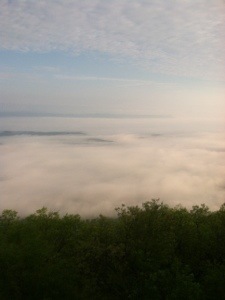 One good thing about my restless night’s sleep was that I awoke at dawn ready to hike. Not wanting to disturb my four shelter mates, I remained in my sleeping bag until around 5:20 when I also heard War Cry rustling around. With her first movement, I began my “getting out of camp” routine. As quietly as possible I moved all my belongings to the picnic table in front of the shelter before deflating my sleeping mat. Knowing the sound would likely awaken everyone else, I saved that task for last. After packing up and drinking as much as possible of my Carnation Instant Breakfast concoction, I was on my way. A little quicker to pack up, War Cry beat me out of camp. With gentle terrain and a heel that hopefully is much better, I anticipated hiking the 14.6 miles to US 501 by 1:00. Early on I took a short break at the Thunder Ridge Overlook where Bill, an AT maintainer, was shooting some early morning photos of the clouds below the mountains. I took a couple of pics as well before moving on up the trail. 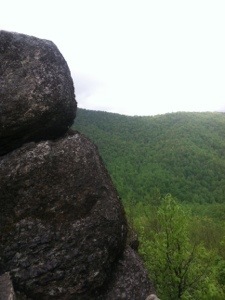 When I reached Petites Gap, War Cry was sitting on a rock taking a break. I likewise stopped briefly. She started up the trail ahead of me; however, I would see her again later in the afternoon. When I got to Marble Spring I walked the 100 yards to fill my water bottles. Then at the Gunter Ridge Trail crossing I took another break to call shuttler Ken to let him know that I would be at 501 by 1:00. From there I hiked toward the next shelter on what was becoming a very hot afternoon. Matt’s Creek Shelter is the only shelter that I’ve seen with a flash flood warning sign attached to its front. Having to hop over wet rocks across the creek to the shelter reinforced my confidence in the stability of my heel. War Cry was taking a break and asked about my shuttle. Having a little knee issue herself, she decided to hike the final 2.2 of the day with me and also ride to Buena Vista. A Wake Forest graduate with two degrees, War Cry has been hiking big miles, having begun her hike on April 6. It was the first time I had hiked with anyone for some time. I enjoyed our conversation as the trail paralleled the James River. 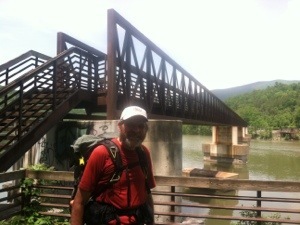 The last .2 mile was across the longest foot use-only bridge on the AT. When we got to US 501 Ken had not arrived. After unsuccessfully trying to reach him, War Cry and I were offered a ride to Buena Vista by Tom Davis, a gentleman from Florida who was on his way to Wisconsin to visit relatives. A retired accountant, Tom and auditor War Cry had a common thread for conversation. Tom was more than happy to become our trail angel for the day as he first dropped War Cry at a hostel before taking me to my motel. Before departing, Tom got both of our web pages’ addresses and said he would check them out. It was a real pleasure getting to meet and chat with Tom. The highlight of my day, however, occurred after I arrived in Buena Vista. Deidra (Johnson) Dryden, a former Shaw student athlete that I coached in cross-country, had invited me to supper at her home. Meeting her children, Jack, Will, Sophie, and Sadie made the evening even more special. The outstanding home cooked meal more than made up for the diet I have been subjected to the past two nights in shelters. Visiting with Deidra and her family brought to a conclusion another wonderful day on my continuous adventure along thenAppalachian Trail. Monday, May 20………A hard rain awakened me at midnight. It felt peaceful and secure under the tin roof of the shelter as the rain pelted it. 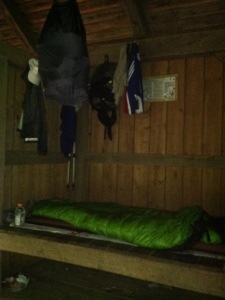 Quickly returning to sleep, I may have slept better last night than any other night I’ve stayed in a shelter. One thing is for sure; it’s the first night’s sleep I didn’t have to pay for in over two weeks. Plans are to repeat the night in the woods tonight. It’s unfortunate that all shelters aren’t as nice as Bryant Ridge. Knowing I only had a 10.2 mile day planned, I lingered at the shelter until 8:25. Spider and ET headed out before me. They always hike about an hour and then take a break for breakfast. When I did start to hike I was immediately greeted with a tough climb. The initial climb was followed by two more of about the same length before I finally got some breathing room at the crest of Floyd Mountain. After passing Spider and ET while they were having their breakfast, I saw no other hikers all day. Later in the morning just as I was thinking that I hadn’t seen a deer in a couple of weeks, a white tail flashed across the trail right in front of me. Don must have been hearing my thoughts. The large deer paused for a minute before moving on. I also saw two large red-headed woodpeckers. Birds of varying species are plentiful on the AT. Hawks can be seen soaring through the sky almost every day. I’ve yet to see an owl, however. 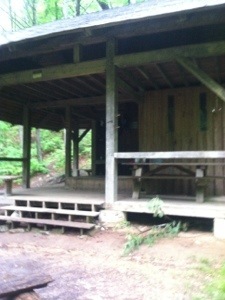 Even though I hiked slower than usual throughout the day, I still reached the Thunder Hill Shelter before 2:00. I really dislike getting to shelters so early because there’s literally nothing to do. Being the only one there, I picked out a sleeping spot and laid out my tyvek. 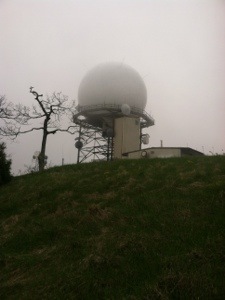 Then I decided to walk back to a crossing of the BRP to see if I could get cell service. None was to be found. So I walked back to the shelter where I swatted flies until bedtime. The pests made journaling as well as eating a challenge. A while later Temp, Stumbles, and Onyx (formerly Alex) arrived. They immediately began debating whether to stay or continue on for an additional 14.6 miles to Glasgow and a shower. Asking my (parental) advice, I stayed clear of the discussion. Finally after cooking and eating a meal, they set out at 5:35, fully expecting to do at least a couple of hours of night hiking. I admire the enthusiasm of the young. After their 30 plus mile day, I doubt that I will see them again. 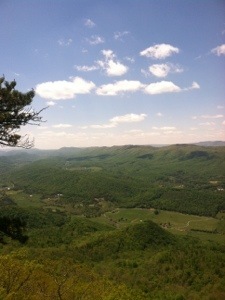 Then with the Appalachian Trail one never knows. 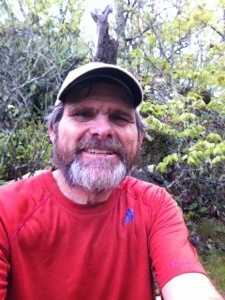 While the debate was underway, David, a hiker out for a few days to get ready for a southbound thru hike he hopes to begin on June 1, and Spider and ET arrived for the night. Just before dark War Cry also walked up to claim a spot in the shelter. After the trio departed the rest of us sat around the picnic table chatting over our meals. War Cry, like myself, has no stove. She too said she just wasn’t using it, so she sent it home. As dusk approached I made one of my fundamental shelter errors. I got into my sleeping bag (mainly to avoid the flies) and fell asleep before dark. Then at a little past 11:00 I awoke to remain so for over two hours. When I go to sleep that early my body thinks it’s a nap. I believe I could have gotten up and started hiking at midnight. Until probably after 1:30 I rolled from side to side numerous times before finally getting back to sleep. It proved to be a reckless night, but all in all the day couldn’t have been more important because the heel feels fine and once again my hike appears to be going well. 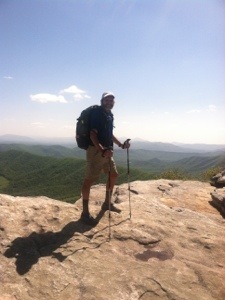 Tomorrow I’ll add mileage as I continue to test the Achilles on the Appalachian Trail. 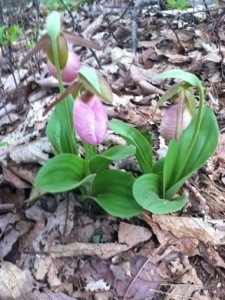 Sunday, May 19…..With a cool, drizzly day awaiting, I couldn’t be more anxious to get back to the trail. 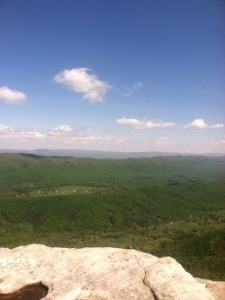 After spending now what seems more like a month than a week in Daleville/Troutville, I need to hike. In fact, if I don’t get back in the woods soon, I fear I may become addicted to the Big Bang Theory. It’s always interesting how one occupies his time when confined to a motel room for days. As much as I like rooms and the conveniences that come with towns, I’m actually looking forward to a shelter tonight. Anyone who has met me on the trail is probably doubting the remark, but at least for today I state it with sincerity. The Comfort Inn, where I’ve resided the past two nights, provides about as impressive a breakfast buffet as any establishment that I’ve stayed in thus far. 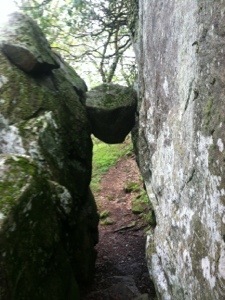 While dining this morning I chatted awhile with thru hikers, Cyclops and Shaman. 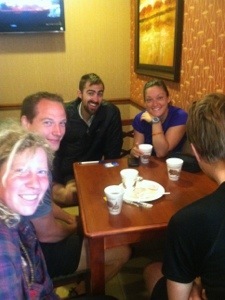 Also preparing to hike out today, they were loading up on a hearty breakfast before venturing back out into the woods. At the next table were Smurf, Pops, and Cub who live in northern Mississippi. Having finished a section hike yesterday, they planned to drive home today. Interested in my reasons for hiking, the three listened attentively as I shared with them my strategies. Cub said he liked my methods. After checking out of my room I took a seat in the lobby to kill some time before my shuttle arrived. While waiting I spent about half an hour talking with Kyle and Johnny, two players for the minor league Frederick Keys. Playing in the Carolina League, the Baltimore Orioles affiliate had a weekend series with Salem, a Red Sox farm team. 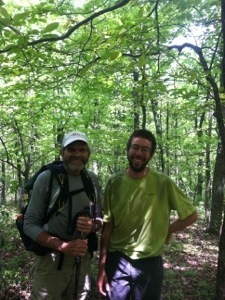 Kyle, who is from Montgomery, asked some specifics about my venture when I told him I was hiking the AT. Johnny noted that I would be out longer than their baseball season. Right on time, Homer’s son Bennett arrived to shuttle me back to the trail at Jennings Creek. Riding and chatting with the former thru hiker and now Virginia Tech sophomore reinforced my faith in the youth of today. At nineteen Bennett seems mature beyond his age. But then what should one expect of a young man who thru hiked the AT with his parents and eleven year old sister when he was eight. It was an honor being taken back to the trail by Bennett. 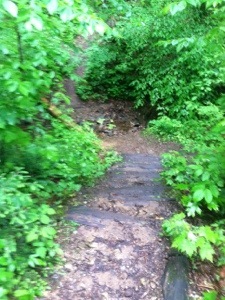 So as I stepped foot on the trail for the first tome since Tuesday, the rain commenced. Fortunately it never got harder than a steady sprinkle as I tested my Achilles on an uphill section from the outset. Very slowly I began to re-acclimate myself with the nuances of the trail. All appeared fine at the beginning. After the climb I faced a downhill section of about the same distance. With each step I gained confidence; however, I reminded myself often that I needed to remain patient. And that’s exactly what I did. When I arrived at the Bryant Ridge Shelter, which is regarded as somewhat of a “penthouse” that sleeps 20, Doodles was there. Only stopping for a break, he headed out toward the next shelter shortly after I arrived. I picked out a good spot to place my mat and sleeping bag and then hung my damp clothes on pegs in hopes that they would dry overnight. 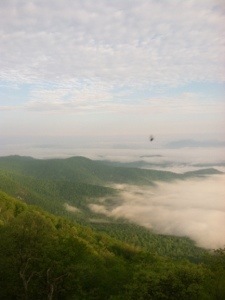 Just when I had everything organized, two hikers I had not met, husband and wife Spider and ET walked up. They are on a lengthy section hike which will end in Waynesboro. Already having finished the Pacific Crest Trail in sections, the couple from the San Francisco area are great company. Spider and I talked about the Pacific Coast Highway and Pebble Beach as he readied his space in the shelter. So I’m finally back in the woods. It was the perfect way to continue the hike. 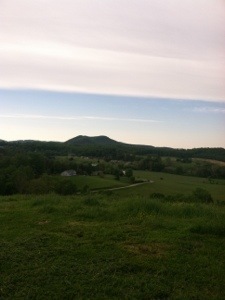 I walked pain free for 3.8 miles over both uphill and downhill terrain. Now I’m in a luxury shelter (as shelters go) on a night when more rain is in the forecast. My fellow shelter mates are congenial and about my age. I have burgers in the food bag for supper and my cozy sleeping bag ready when darkness comes. I’m a very contented hiker at the moment. It feels so good to once again be hiking on the trail I hope to follow all the way to the Maine, the very special Appalachian Trail. 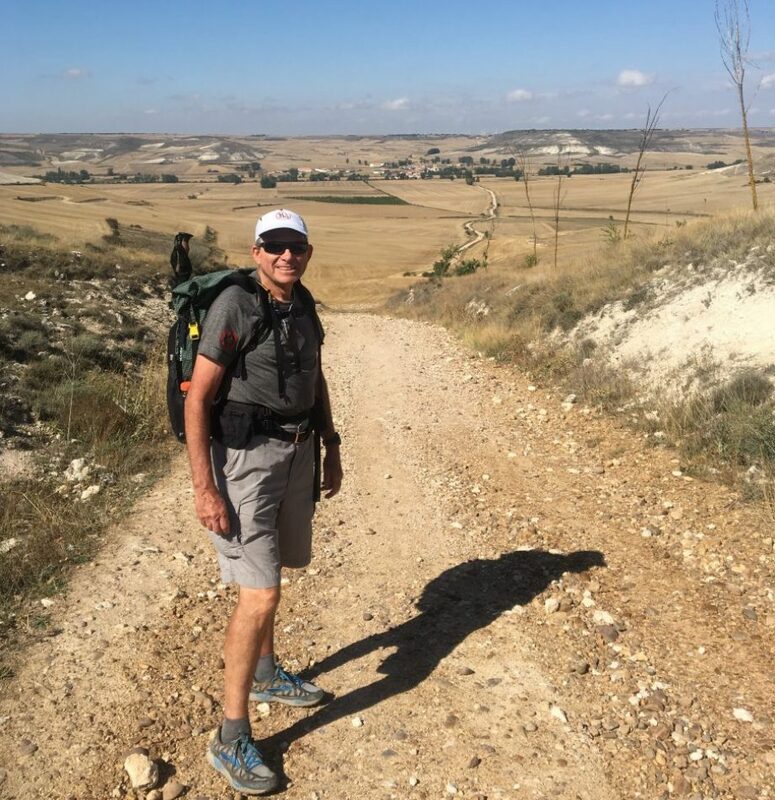 As I planned this hiking adventure throughout the fall and winter, I wrote about my reasons for referring to the endeavor as my “hike of hope.” One objective was to raise awareness of the multitude of challenges a person with ALS faces. I wanted people following my walk to understand that a thru hike of the Appalachian Trail, be it difficult in its own way, pales in comparison to those challenges a victim of Lou Gehrig’s disease must confront. 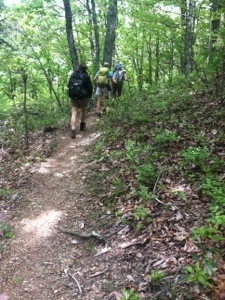 Hikers of the AT have the use of their arms and legs to navigate both strenuous as well as less difficult sections of trail. Most ALS patients eventually can’t use any of their extremities. Their mind remains the same; their bodies just stop working. Each day that I hike I remind myself of just how active my brother was before his diagnosis and just how quickly he lost all ability to be active. He knew there was no cure, and he knew that he would never get any better. Still with a strong faith and surrounded by so many who loved him, he persevered. Sometimes, I don’t know how. Watching his transformation from an avid bass fisherman, hunter, and excellent softball player to a man forced to sit in a power chair and have others do everything for him was excruciating for all Don’s family and friends to endure. For him it must have been beyond any agony the mind can conceive. So another of my “hopes” as I started the walk from Springer to Katahdin was that I could raise some funds for ALS research. I didn’t set a monetary amount as a goal because I wanted my brother’s friends, my friends, and perhaps those who never knew either of us to give because they wanted to help make a difference. I don’t know if whatever monies I raise will be substantial enough to provide researchers with what they need to finally determine a cause and treatment for ALS. But they just might. What I do know is that every time a new diagnosis is given, another person, along with his family and friends, has no hope. None. That’s a sobering thought. While I’ve hiked each day I’ve spent a lot of time thinking and reflecting. Always enjoying numbers (even though I was an English teacher), I often find myself doing trail math. How many miles will I need to average to finish the hike on a certain date? How many days off can I take if I average 15 miles a day? If I only hike 10 miles tomorrow, can I do 20 the next day? If I cover two and one-half miles an hour, when will today’s hike be complete? I seem to always be thinking about numbers. Numbers are important on the trail just as they are in research. So now that I’ve completed over one-third of the trail with the full intent to get it all done, I would like to ask my readers to consider making a contribution to the ALS Association or The ALS clinic at Emory at my website, donsbrother.com If 100 people gave $50…….I’m thinking about numbers again. There is a “Make a Donation” drop down tab at the top. While you’re at it, if you haven’t already, please spend some time reading about my brother on the “Don” pages, also at the top. If my brother were here he would be saying, “Stop asking these people for money and get on with your hike.” But Don is not here which is why I feel a need to try to help find a cure for the disease that took him from those he loved and from those who loved him. As I wait to return to the trail on Sunday, I just felt like it was the appropriate time to reach out. I won’t do it again. 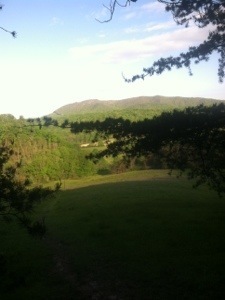 What I will do, however, is keep walking north on the Appalachian Trail. And every day that I hike I’ll keep remembering my brother and of course reminding myself often that above all, Donald was a man of faith who loved his family, but I’ll also keep remembering how much Don loved the woods. One good thing about taking a few days off is that I’ve had the opportunity to meet some new hikers as well as reacquaint myself with folks I passed weeks back. Last night Boo Boo was relaxing in the lobby of the Super 8. Having read his trail journal since before I started, it was a real pleasure finally getting to meet him. Also dealing with some minor injuries, Boo Boo has had to rest some as well. This morning he was getting ready to hike out of Daleville. I have a feeling, however, that I’ll see him on the trail in a few days. Two of the Germans, Pacemaker and Runner-up, also were here. I had first met them around Hot Springs. Runner-up speaks better English than some of the locals I’ve met along the way. He even referred to something as a “catch 22.” Gotta like a reference to Yossarian. Hiking with visas that have expiration dates, the foreigners must confront other time issues. Runner-up’s visa lasts until mid-September. 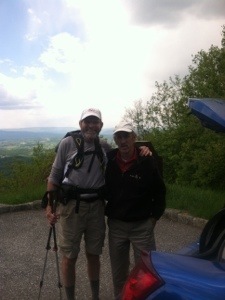 He and Pacemaker seem like strong enough hikers to reach their goal by then. 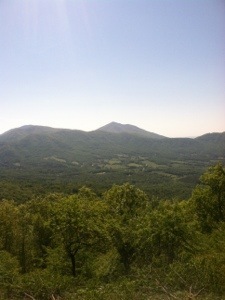 It would be tough to find oneself within a couple of days of Katahdin with a visa about to expire. 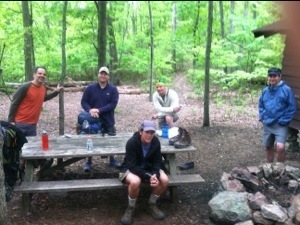 Big Red and Yooper were also getting ready to hike north this morning. Big Red, the first hiker I’ve met from Missouri, said he had heard of me. I’m not sure what that meant. In high school Don had an Irish setter named Red. I hadn’t thought about that dog in a long time. Amazing where the memories appear. Yooper, who calls Michigan home, appeared refreshed from the town stay. With a pleasant smile under her brimmed hat, she looked ready to resume her hike. As I’ve rested over the past three days I’ve thought of all the hikers whose paths I have crossed over the almost two months I’ve been on the trail. I wonder how many are still hiking and which ones have ended their hikes. Yesterday I decided to text message Rocket and Whiskers, the couple from Cambridge. Whiskers messaged back that they were headed into Waynesboro today. That’s a little over one hundred miles up the trail. I also contacted Slim Jim. He was almost to Woods Hole, about five days behind me. So I continue to rest, take care of the tendon, and wait. I also continue to remind myself that it’s better to wait than to hike before I am ready. As one of my old buddies has stated in a message, “the trail will wait for you.” Roger is right. It’s waiting as I wait. Hopefully, I will be ready again soon because one thing the setback has reminded me is just how much I want to get back into the woods. 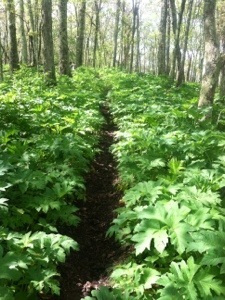 It shouldn’t be long now before the walk toward Maine resumes on the Appalachian Trail. When I started planning this hike back last fall, I prepared a tentative timeline up to New Hampshire. As I regularly perused the schedule, I noted where I should be on my birthday. It wasn’t in a motel room in Daleville, VA. Then again, we never really know where we may be on any given day. When he turned 53 in July, 2010, my brother didn’t know that less than a year later he would be facing an ALS diagnosis. So while I can’t help but lament my injury, I’m reminded just how insignificant it is in the big realm of things. In fact, compared to Donald’s plight, it’s like comparing a penny to a billion dollars. Come to think of it, that’s not even a wide enough margin. So as I continue to rest and hopefully heal, I’m also reminding myself of the virtue of patience. When we are generally healthy, time is the healer. When someone has a terminal illness, however, time is merely that space between life and death. But aren’t we all living somewhere along that indefinite line? No one knows exactly how much time we have left on this earth. What we do know is that every minute of every day is precious. We can’t waste even one second of the time we have been given. So as I sit here enjoying a second cup of McDonald’s coffee, I’m trying to dwell on the positive rather than the negative. My family loves me and is supportive of this adventure, my friends have showered me with good wishes for success from the beginning, I’m generally in excellent health, and the Achilles will heal. I know how to rehab the injury, which I am doing. I also know that rest is important. 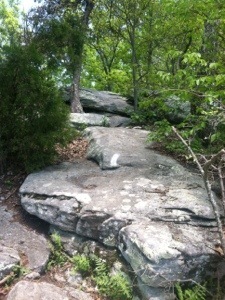 So despite the setback, the trail awaits when I am ready to continue the hike. And now, six hours later, much good has occurred. The new shoes, along with some high powered anti-inflammatories, have arrived. I’ve continued to “doctor” myself throughout the day, and I’m walking without the slightest limp. Plus the tendon generally feels a lot better. If progress continues (and there’s no reason to think it won’t), the plan is to resume the hike on Sunday. Now I just need to continue what I have been doing in the rehab department. With time on my hands, I’ve thought about my brother often today. I greatly miss his birthday calls. Many times over the years Don would treat me to a Braves game later in the season to celebrate. I’ll never attend another game at Turner Field without remembering those special moments. Things happen for a reason. We don’t know why, but we accept. 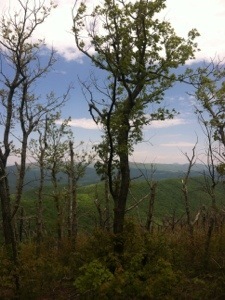 So I’m accepting this minor setback with patience, until I can hike again on up the Appalachian Trail. 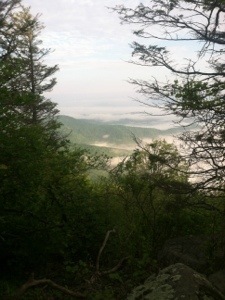 Over the course of the last eight weeks I’ve met a number of interesting folks on the Appalachian Trail. Most recently, Howdy Man appeared just as I was praying that another hiker would be around when I made the descent of Dragon’s Tooth. Having stressed all day over a part of the trail that many say is the first significantly technical section, I feared that I would have to tackle the narrow ledges alone. Then just around a bend on the climb up the southern side, there sat Howdy Man. After I told him that he was a Godsend, Howdy informed me that he hiked slowly and liked to talk. Letting him know that was fine with me, I listened. Howdy began by actually posing a question. He wanted to know why I was hiking the AT. So I told him about my brother and how his illness and death had been a factor in my decision to hike. Several times Howdy looked over his shoulder as I talked, seeming to appreciate my reasons. 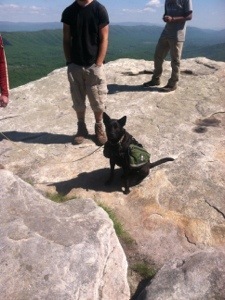 Then he explained why he was on the AT. Although only twenty-two, Howdy said that he had already comprised a “bucket list.” And on that list was hiking the Appalachian Trail. He went on to say that initially he considered eliminating that goal, thinking he would never find the time. Then, however, he decided what better time than now. Even though he has a degree in Mechanical Engineering in hand, Howdy said he has always wanted to be a policeman. He would later talk of small town departments where he might like to work, as I concentrated on getting off the ledges without a slip. For such a young fellow, he appears to have a firm grasp on his future. With dark clouds overhead and a thunderstorm imminent, I hoped that my new hiking buddy would pick up his pace. He didn’t. Still, I figured hiking over the dangerous stretch with another hiker nearby outweighed passing Howdy now only to reach Dragon’s Tooth alone. As the sky grew darker, we finally arrived at the blue-blazed trail to the monolith. Even though we knew that rain was on its way, we both wanted to see the famous “tooth” before venturing on up the trail. We didn’t linger, only taking a few pics before retracing our path back to the white blazes. Just about the time we started the climb down, the black flies made their appearance more noteworthy. As Howdy Man led the way, I followed, swatting flies with one hand and balancing myself with the other. Howdy just kept smiling and talking. All was good. Each time I thought we had finally come to the end of the dangerous section, another portion requiring the use of hands appeared. Howdy thought it was great fun, and as matter of fact, after the initial adjustment to hiking without poles, so did I. Howdy Man’s companionship for the descent allowed me to fully enjoy a section of the trail I had been dreading. When we finally did reach level ground, I hiked on behind Howdy Man until the rain started. Noticing that he had picked up his pace a little, I assumed Howdy would hike with me to the road and walk to a nearby store to dry out. That was not to be the case. When the raindrops got bigger Howdy suddenly stated, “That looks like a good spot,” as he ducked under a tree to pitch his tarp. It didn’t look like that good of a spot to me, but then, I wasn’t the one pitching the tarp. I yelled goodbye before moving on. Three days later I again saw Howdy on the trail. He asked me if I had tried his “cowboy camping” yet. I told him that I had not, but I’m sure if I do, I’ll remember Howdy Man as I look up at the stars. For a person so young, Howdy resembles many on the Appalachian Trail. He simply walks one day at a time from where he is to where he thinks will be a good place to spend the night. Life can be rather simple when all one has to do is awaken each day to follow the white blazes toward Maine, and the northern terminus of the Appalachian Trail. The best laid plans……maybe it was the 25 mile day on Sunday, maybe it was the cumulative miles, maybe it was too many hills…..or probably it was the new shoes. Whatever it was, I had to cut today’s hike short with a very sore right Achilles’ tendon. From the outset I realized that an adjustment in miles would be necessary before the day ended. Since I have hiked relatively injury free for 53 days, I knew it was inevitable that I would eventually suffer a setback. Now I just hope it’s brief. Having had tendinitis on many occasions over my years as a runner, I know how to treat the ailment. More significantly, I realize that the most important component of recovery is rest. So I’m back in Daleville for at least three or four days. A cool, pleasant sunny morning greeted Speck, Little Seed and me as we headed up the reasonably level trail from Harvey’s Knob. After less than a mile, however, I knew the day would be a challenging one. Not due to the terrain, but instead due to an Achilles that began talking to me in a language that I unfortunately had heard before. It repeatedly asked me to give it a rest until I finally realized that I needed to slow down. So I gingerly attempted to hike without a limp throughout the morning. Finally, I gave up and limped. Relying heavily on my poles, I somehow still got in 12.1 miles. 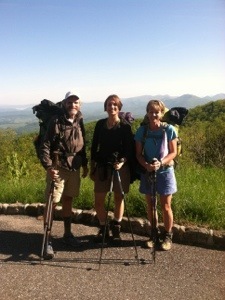 My hiking companions were nice enough to stop at the first crossing of the Blue Ridge Parkway to allow me to catch up. It was then that I told them to hike on and not worry about me. Surprisingly, for a couple of miles I stayed with the two as the soreness temporarily subsided. Then just as quickly, it returned with a vengeance. 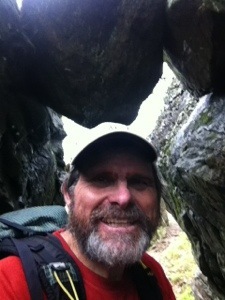 I hobbled the next few miles, finally reaching the Cove Mountain Shelter where my two buddies were having lunch. Also at the shelter were the two Jersey boys we had met yesterday, Calves (not Cabs) and El Gato. They had been joined by three other section hiking friends, Sandbaggers, GG, and…..I can’t remember the strongest hiker in the group. Shoot me an email when you get home and read this, Calves. As I dejectedly ate two peanut butter and jelly sandwiches, Speck finally asked me what I was going to do. Reluctantly I told her I felt like my best option was to try to get to VA 614, Jennings Creek, and go back to town. The other option was to hike on to the planned shelter and face a more challenging day tomorrow, with a very sore tendon. I think I made the only sane decision. All the others commiserated with me until I tried to alter the gloom with laughter. It hurt, but I knew walking away from my friends of only a few days was really all I could do. Watching Speck walk into the distance and eventually disappear over the horizon was one of my lowest moments on the trail. We had become good friends in a short period of time. I will miss her. Still I have to move on. As I continued to very slowly make my way toward the road, I called Linda. She too felt for me. After a brief emotional moment I knew I had to walk on up the trail….for now to a road where old reliable Homer would be waiting, but in a few days back to the same spot to continue north. Again, there really wasn’t any other choice. When I finally reached the road, Homer too showed remorse over my situation. On the drive back to Daleville I outlined my rehab plan to him, mainly so that I could hear it aloud rather than just in my thoughts. Part one was to call my good buddy John Teeples. John is overnighting a new pair of Cascadias one half size bigger, along with some other items that should help with the injury. But for the rest of the night and the next few days, it will be ice, anti-inflamatories, and rest. As I assess the situation, I’m still determined to stay positive. After all, I’m over a week ahead of schedule with 15 mile days. I can still take ten days off and finish on the day I planned, and even if I need to finish a little later, Baxter State Park usually remains open until mid-October. So I’ve had a little setback. I’m really grateful that it didn’t come earlier and that hopefully, it isn’t that serious. Trail news may be somewhat diminished for the next few days; however, I hope to see a few of the hikers I’ve passed recently as they arrive in Daleville. My brother would say, “Rest, get better, and get going.” I’m listening Don. 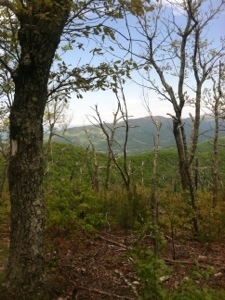 In just a little while I’ll be walking again on the Appalachian Trail. There is a section of the Appalachian Trail in northern Virginia that is referred to as the roller coaster. 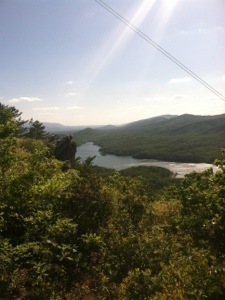 In a way every day on the AT can metaphorically qualify as a roller coaster. From the physical unending ups and downs to the emotional ebbs and flows, each day comes with its set of challenges. On some days I awake and think, “Do I have to hike again today?” Then when I take that first step on the trail, all is well with my world. On other days I wake up raring to go only to suffer a case of the doldrums within the first couple of miles. Like in life, there is no certainty to how a day will turn out on the trail. I sometimes find myself identifying with Gulliver in Brobdingnag while at others I seem to be Odysseus looking for Ithaca. 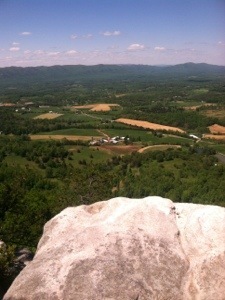 Today I got the opportunity to again hike with Speck, along with Lost Girl and Little Seed. 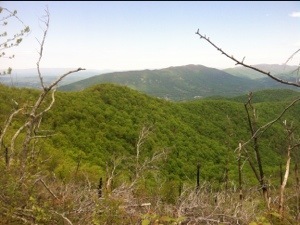 We departed from Daleville at 7:30 with a planned 16.1 mile day, which would take us to Harvey’s Knob Overlook. A rather mundane trail today, no views were evident until we reached the first of three crossings of the Blue Ridge Parkway. Such crossings will continue regularly through the Shenandoah’s. Other than a couple of stiles and four or five short stream crossings over rocks, nothing really stood out. 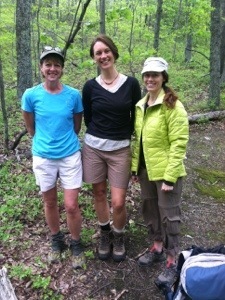 We did meet two hikers from New Jersey who have section hiked over 1700 miles. El Gato and Calves related some of their hike to us during one of our breaks. I at first thought Calves had said his trail name was Cabs even though he was pointing to his lower leg when he told me. It took me a while to understanding what the man from Jersey was saying. Both seem like great guys. Considering where their section is scheduled to end, there’s a good chance I will see them again tomorrow. 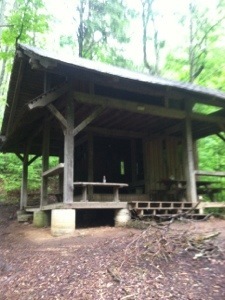 When the three ladies and I reached the Wilson Creek Shelter we took a lunch break. A couple of day hikers were there with their dog. The pooch didn’t seem very friendly, so I failed to get his name. As we relaxed, El Gato and Calves stopped by. They were headed to the next shelter for the night. Also passing by was Howdy Man. It was good to see my young friend from Dragon Tooth again. With a somewhat cold breeze beginning to make us a little uncomfortable, we finished our lunch and then resumed the hike. 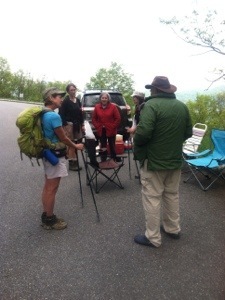 At the second crossing of the BRP two folks had set up chairs and were providing some trail magic. Footnote, a former thru hiker, and his wife Pat had quite the spread. From fruit and vegetables to cookies, pound cake, and milk, it was all good. The popcorn, however, seemed to be the favorite. 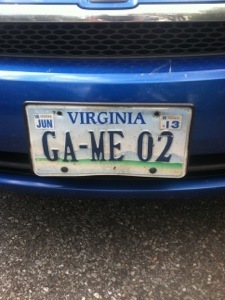 Footnote also told us about his recent completion of a hike of the entire Blue Ridge Parkway. It was nice to spend a little while chatting with Footnote. 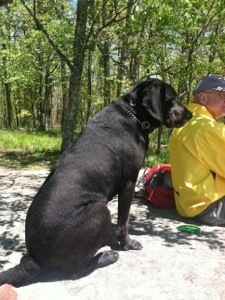 When our group reached Harvey’s Knob Overlook, Homer was waiting for one final shuttle back to Daleville. Very tired from the hike and poor sleep last night, I briefly dozed on the ride back into town. Now I’ve got to make the walk down to Kroger for some groceries because tomorrow it’s back to the woods for two nights. Even though the views were minimal and the trail more of the same, again it was a good day to have nothing to do but walk. 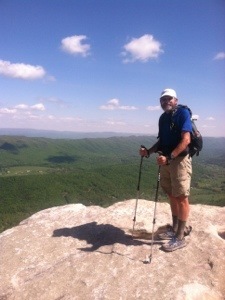 I continue to think about my brother Don often as the journey continues northward on the Appalachian Trail. 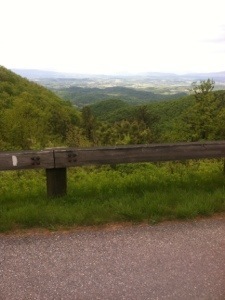 My now good buddy Homer and his lovely wife Teresa dropped me back at the trailhead off VA 624 at a little before 7:00. After a short climb, the trail crossed more pasture land with numerous stiles. Other than a few patches of mud, it was a comfortable trail on an equally comfortable, cool sunny morning. I made really good time, reaching the large parking lot at VA 311 to Catawba in a little over two hours. 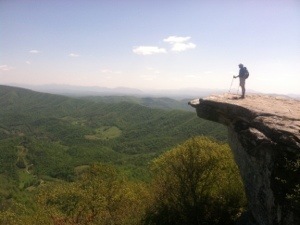 Lots of day hikers had parked there for their climb up to McAfee Knob. 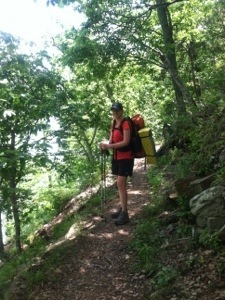 As I began this segment of trail, I met four such day hikers from Blacksburg. A little later I passed a large group including a lady carrying a baby in one of those harness-like apparatuses. 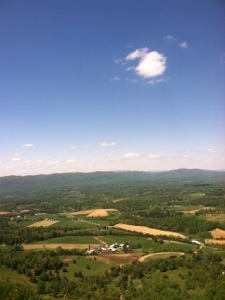 On such a gorgeous weekend day, many were in pursuit of the spectacular views that McAfee has to offer. 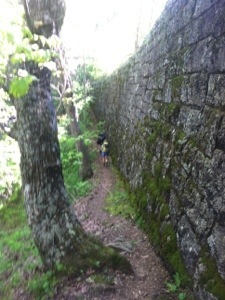 This section of the AT is one of the most visited on the entire trail. 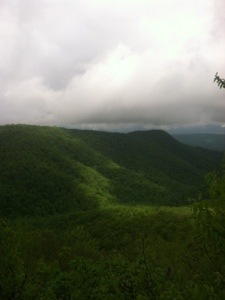 Easily accessible from VA 311, many will hike the just short of four miles trail, up and back. 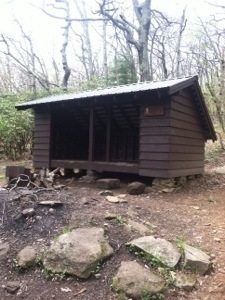 On the way up the trail I stopped by Johns Spring Shelter where I had had the snake incident on a section hike. See “Snakes” in my prep entries. Half and Half and Rango, two young hikers I had met about a week ago, were packing up to leave. 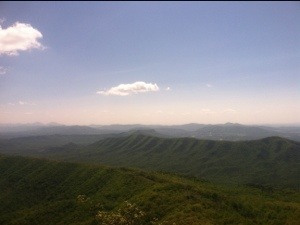 They scooted by me a few minutes later; however, when I got to McAfee Knob they were both there along with Torch. The three asked if I would take their picture. I took several of the three friends, and Half and Half likewise took a couple of me. 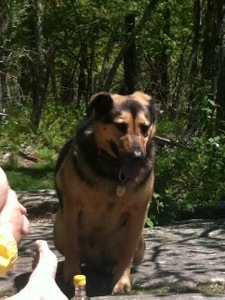 Also on the knob was former thru hiker Low Gear and his dog Tonka. This proved to be a banner day for dogs, and I know my brother would have liked them all. As advertised, the views from McAfee were beyond spectacular. A more perfect weather day could not have been had. After just soaking it all in for about ten minutes, I headed on up the trail toward Tinker Cliffs, a half mile cliff walk with a continuous view to the west. Planning to take a break for lunch, I came upon a couple from Radford, Frank and Ellen. They had quite the picnic going complete with wine. Ellen offered me a sandwich, but I chose to just eat one of the three I had brought with me. Again I had the good fortune to also be in the company of two very well-behaved dogs, Dee and Sam. From Tinker Cliffs I passed several other vistas over the next four hours. Toward the end of today’s hike, the trail alternated between rocks of varying sizes and soft pine straw. I’ve actually begun to enjoy some of the rock hopping that is required on the occasional boulders. Before reaching Daleville, the trail also passes under power lines five times. 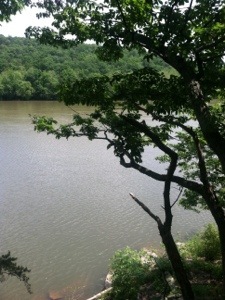 At one of these spots with a view, a lady and two children had walked up to enjoy the scenery. On a picture perfect day, I can easily understand why. About 200 yards before the trail reached the highway in Daleville, Jungle Juice had set up his tent. I had last seen him on Tuesday in his sleeping bag at the Rice Field Shelter when I was hiking in the rain. An easily likable young man, he seldom goes into towns except to re-supply. That’s the case with a lot of the young folks on the trail. When I reached the road I walked on across to where the trail begins to climb again. Then I stopped, turned around, and headed back to my room and a hot shower. A little later I joined Speck, Lost Girl, and Little Seed for a meal at a Mexican restaurant. It was a delightful way to conclude my day, dining with the three ladies. When Lost Girl couldn’t finish her fajitas, Speck suggested we take Jungle Juice some town food. So I ventured back up the 200 yards of the trail and presented JJ with the gift from the ladies. He was most appreciative. Throughout today’s hike I thought often of my mother. This was the first Mother’s Day in my entire life that I had not spent some time with her. I did call her twice. Since it was her first Mother’s Day without her other son, I knew that Donald was on her mind throughout the day. On my first call I also got to speak with my wife, Linda, and wish her a Happy Mother’s Day as well. The views on today’s hike were special, but no view is as special as the two most important mothers in my life. 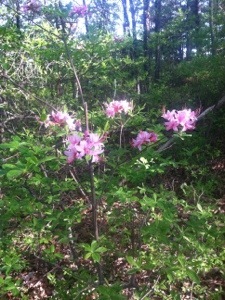 To all I know who qualify, Happy Mother’s Day from the Appalachian Trail.